Bring out the stunning color of your brick or faux brick historical exteriors with this cost-effective, durable fiberglass door. 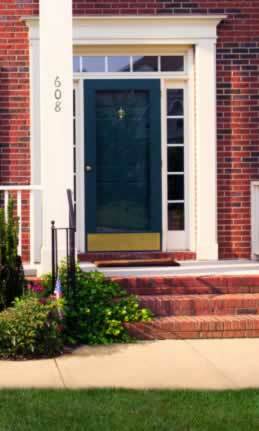 Fiberglass doors lead the marketplace in versatility. You'll find the color to match your home, no matter the historical theme or style. You won't find doors that are easier to maintain, or that offer energy efficiency like Fiberglass. Sidelites and transoms let ambient light stream into your entrance hall. Add e-coatings to the windows to protect your flooring and furnishings from potentially ultraviolet rays. The hefty, brass kick panel helps preserve your investment and it adds flash to the overall, traditional design. These fiberglass doors can be hinged to open from either side, depending on your scheme. You won't need to spend a fortune to make your home look like a million.